The mission of Feline Friends, a Humane Society of Yuma membership committee, is to humanely reduce the feral cat population within Yuma County by practicing T.N.R. ALL CATS ALTERED THROUGH OUR FERAL TNR PROGRAM WILL HAVE ITS EAR NOTCHED TO SHOW ANIMAL HAS BEEN ALTERED. THERE IS NO EXCEPTION TO THIS WHEN USING THIS PROGRAM. ALL CATS MUST BE IN A HUMANE CAT TRAP. *CARDBOARD BOXES, CAT CARRIERS OR CAGES ARE NOT PERMITTED. Feral cats are the wild offspring of domestic cats and are primarily the result of pet owners' abandonment or failure to spay and neuter their animals, allowing them to breed uncontrolled. Feral cat colonies can be found behind shopping areas or businesses, in alleys, parks, abandoned buildings, and rural areas. 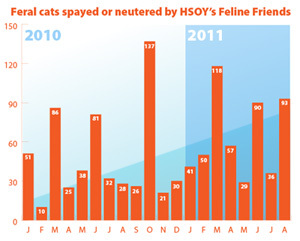 Trap - Neuter - Release, or TNR, is a method of managing feral cat colonies humanely and effectively. Feral cats are trapped in humane cages using food as bait. They are then spayed or neutered and released where they were originally trapped. We are able to continue to track these colonies because a cat that has gone through the TNR process will have the tip of his/her ear "tipped" off. That way if a cat is ever re-caught for TNR, he/she can be re-released and will in-turn save precious resources. These cats will also be vaccinated for many feline diseases including rabies. What should I do if a cat starts hanging around my house? er several days of feeding, please contact Feline Friends (see contact information on back of brochure). We will let you know if the colony is currently being managed. If you see a cat with a notch on it's ear, it has already been trapped, neutered and returned. Why should I support TNR? The mission of Feline Friends, a Humane Society of Yuma membership committee, is to humanely reduce the feral cat population within Yuma County. 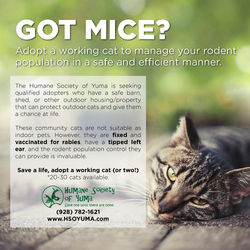 To educate the public and all local governments about all issues related to Yuma's feral cat population. To examine, research and identify what other localities, cities and agencies are doing in order to humanely address the issue of feral cat overpopulation. To seek funding in order to train and educate the public and to implement humane TNR (trap neuter release) programs throughout Yuma. 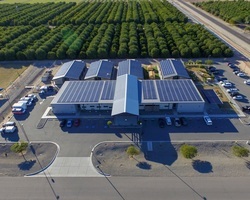 To explore the procedures needed to create and implement laws that address any crimes related to the dumping of animals in the desert, rural or urban locations. 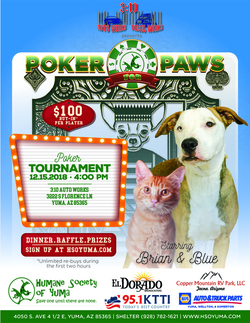 For more information, email felinefriends@hsoyuma.com or call (928) 782-1621 ext 355. *Once you sign up and register your colony with the link above, you will be placed on the waiting list. 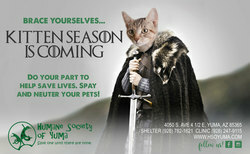 A Humane Society of Yuma staff member will then contact you, via email, WHEN a surgery spot is available.